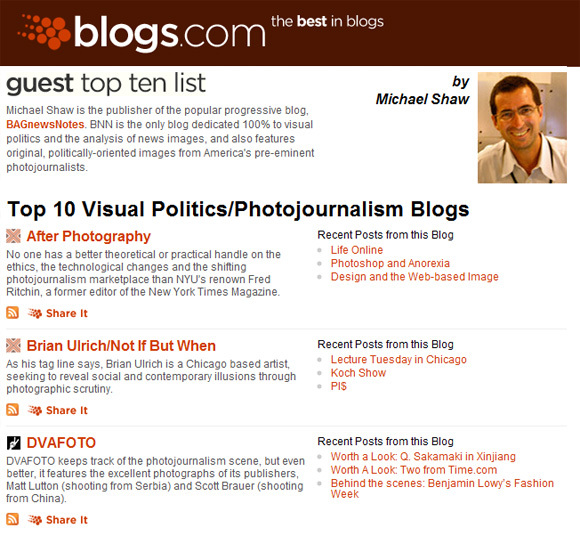 Thanks to Michael Shaw of BagNewsNotes for including dvafoto, my blog with Matt Lutton, in the top 10 list of visual politics/photojournalism blogs over at blogs.com. We’ve been seeing steady increases in discussion, traffic, and linking over the past year that dvafoto has been going strong, and we have no inclination to stop. Here’s to another year.